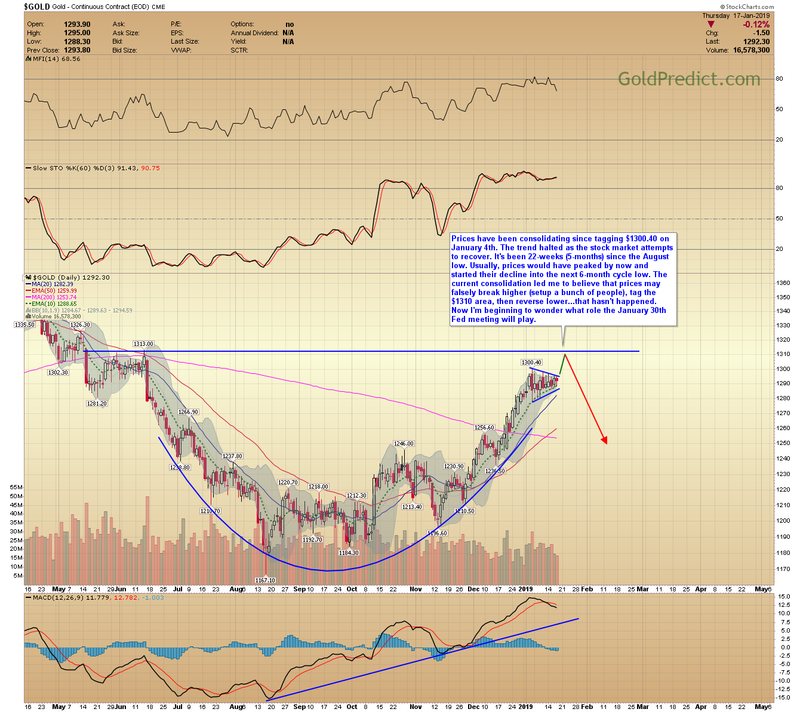 Gold and silver remain in their short-term consolidations. Miners may be forming small bear flags at the 200-day MA. 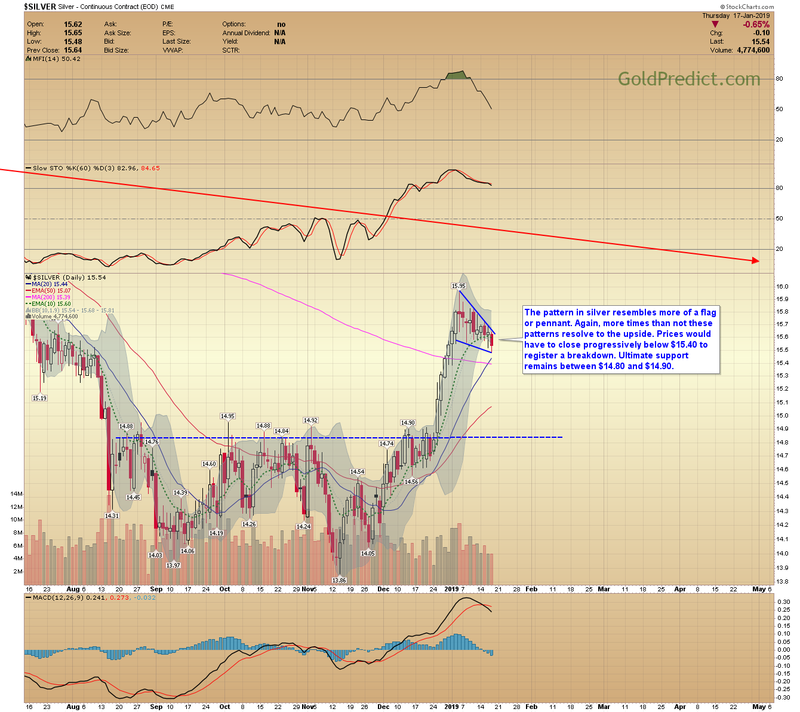 Overall, Gold bottomed five months ago, and the intermediate trend is mature. Prices should be close to starting their decline into the next six month low. Provided, the 6-month cycle is still valid…which is up for debate. 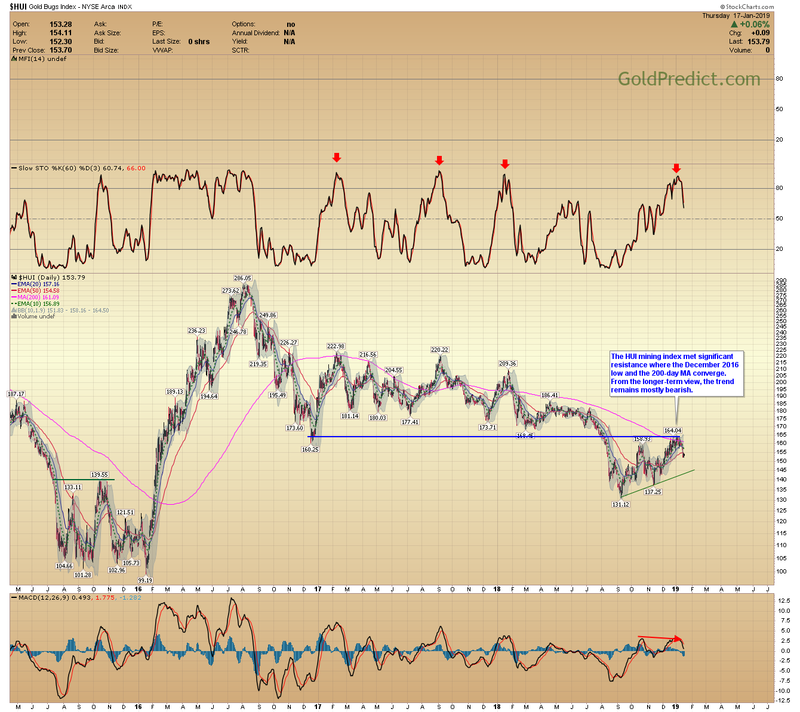 The longer-term charts of the HUI and XAU still carry a bearish tone. Their lat 2018 rallies failed to recapture the 2016 low as well as the 200-day MA. -GOLD- Prices have been consolidating since tagging $1300.40 on January 4th. The trend halted as the stock market attempts to recover. It’s been 22-weeks (5-months) since the August low. Usually, prices would have peaked by now and started their decline into the next 6-month cycle low. The current consolidation led me to believe that prices may falsely break higher (setup a bunch of people), tag the $1310 area, then reverse lower…that hasn’t happened. Now I’m beginning to wonder what role the January 30th Fed meeting will play. -SILVER- The pattern in silver resembles more of a flag or pennant. Again, more times than not these patterns resolve to the upside. Prices would have to close progressively below $15.40 to register a breakdown. Ultimate support remains between $14.80 and $14.90. -GDX- Since Tuesday, prices have formed two small consolidation days teetering the 200-day MA. It could be a small bear flag. If correct, then we could see prices break lower in the next day or two. However, significant support remains between $19.80 and $20.40. Prices would have to close progressively below the Fed crash low ($19.80) to register a failure. -GDXJ- Same with juniors. We could have a small bear flag building at the 200-day MA. Their Fed-day low arrives at $30.14. 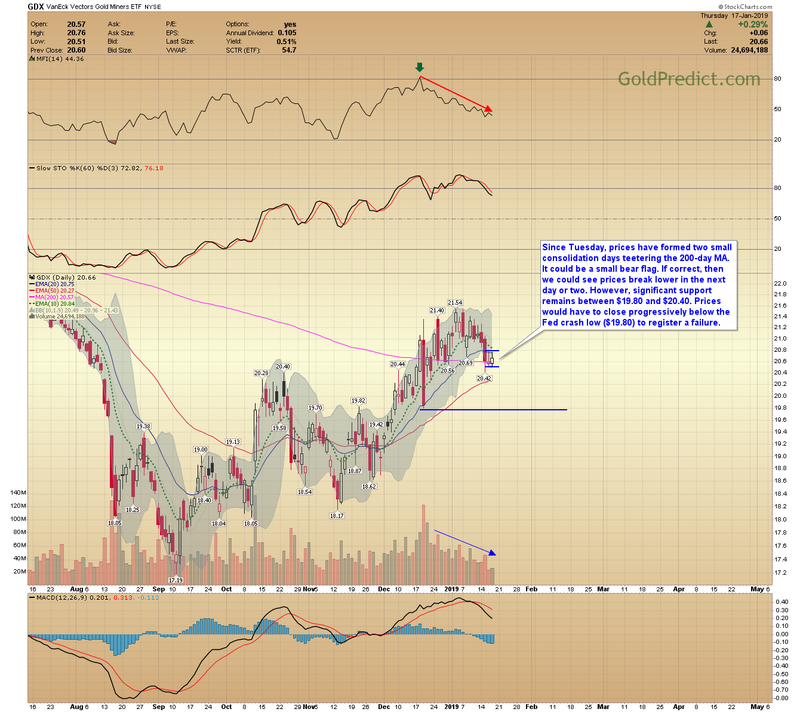 -JDST- I’m contemplating reentering JDST for a quick swing trade…in case miners break lower. If I take the trade, I keep a very tight stop just under $48.00. -HUI- The HUI mining index met significant resistance where the December 2016 low and the 200-day MA converge. From the longer-term view, the trend remains mostly bearish. 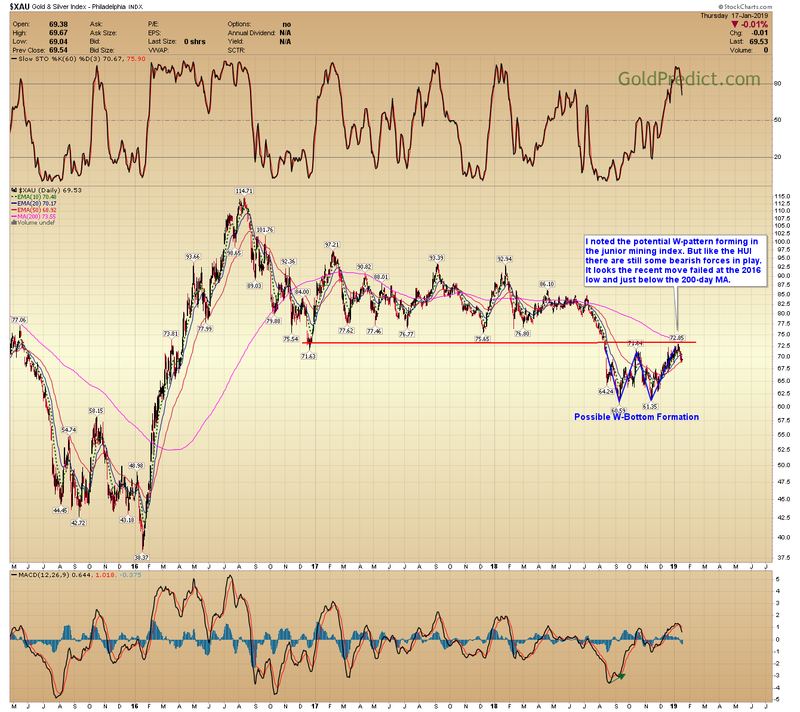 -XAU- I noted the potential W-pattern forming in the junior mining index. 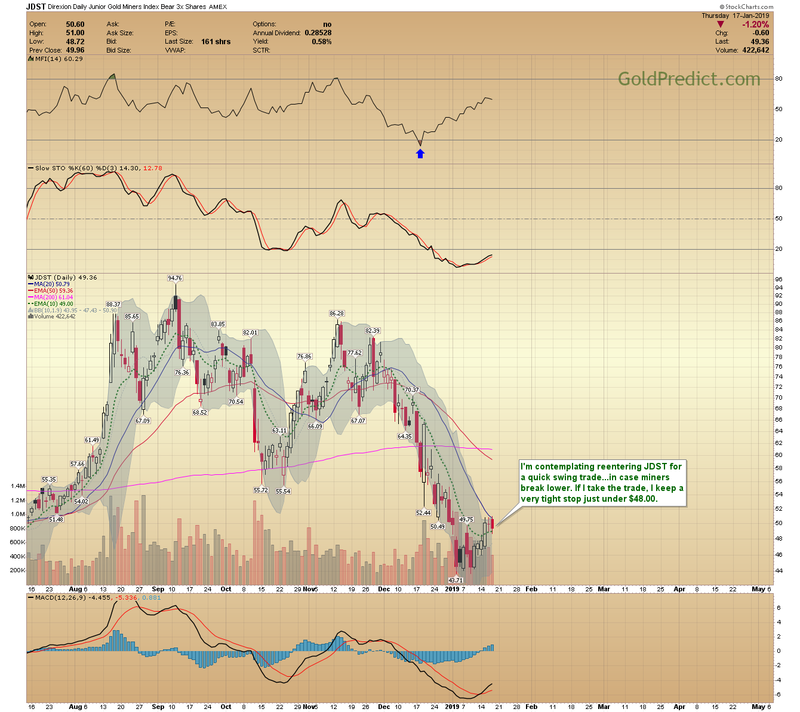 But like the HUI there are still some bearish forces in play. It looks the recent move failed at the 2016 low and just below the 200-day MA. -SPY- Stocks closed just above the October/November closing lows as well as the 50-day EMA. This is where I thought the trend would begin to see trouble — no sign of pushback just yet. 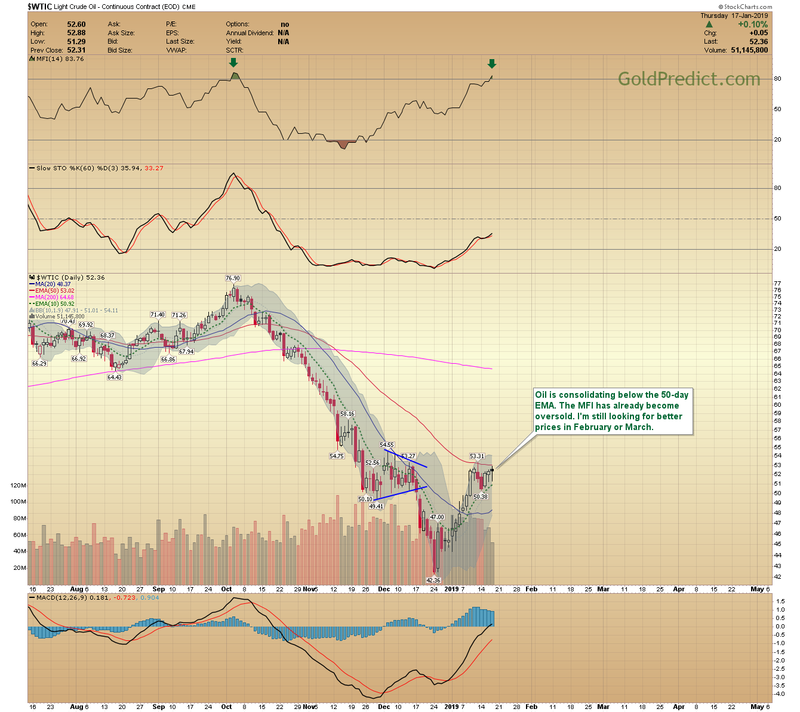 -WTIC- Oil is consolidating below the 50-day EMA. 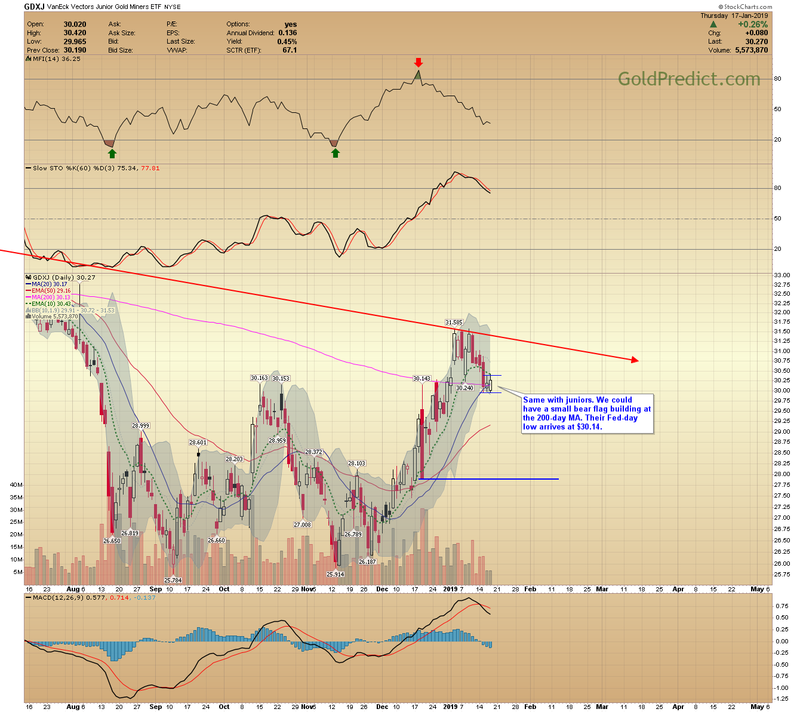 The MFI has already become oversold. I’m still looking for better prices in February or March. I’ll probably remain on the sidelines until I see a better trading setup. I’m also keeping positions small, due to the overall economic uncertainty. 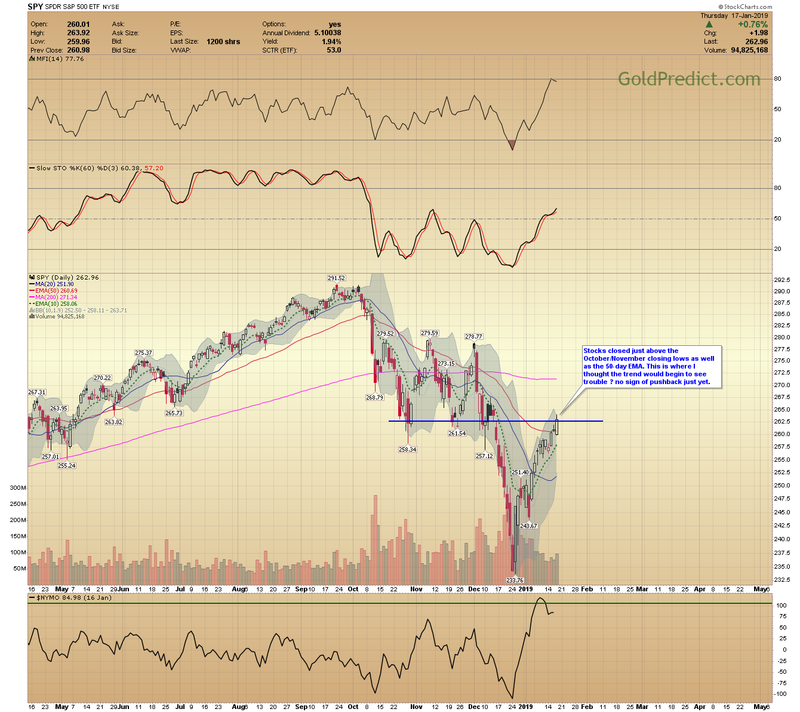 I will discuss some more big picture trends in the weekend newsletter.